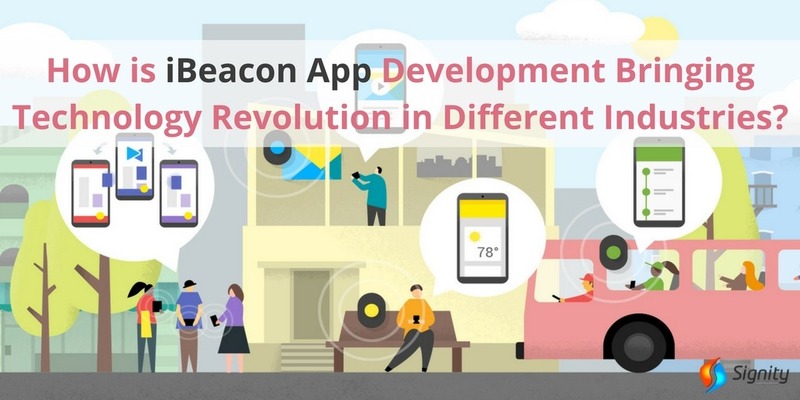 How iBeacon App Development is bringing Technology Revolution in different industries? Advancement. Webster’s dictionary defines advancement as the act of being raised to a higher rank or position. That’s exactly what iBeacon stands for. An advancement in the kind of technological progress we haven’t witnessed till date. iBeacon simply takes technology to another level and this again is just the beginning of something really huge and out of the mind box. We have all experience the benefit of GPS. Travel and explore the unexplored without losing your way. Now imagine entering a huge shopping complex or an office space with more a than a hundred office addresses. You don’t know the direction of any section and the floor map isn’t helping you either. With iBeacon technology, your smartphone transforms into a guide and can simply help you spot the location you want to reach. The revolutionary iBeacon technology has given mobile apps a complete makeover and has redefined mobile technology. iBeacon works as an indoor or outdoor locating system. It transmits a notification of relevant information to any of the iBeacon devices. It’s a location tracking device. It uses proximity technology and provides a greater advantage over GPS as it can work well in the absence of Wi-Fi and internet networks, making it an independent service. In short, iBeacon technology based apps can push notifications to their users about any product from a distance without the need of any network within the precincts. The iBeacon utility is massive. It isn’t restricted to a particular industry or sector. iBeacon mobile apps soar above its contemporaries in two major spheres – high security and privacy protection features and the ability to provide a greater value to their user experience. These factors make iBeacon the perfect option for very many businesses. 1. Beacons across various businesses: iBeacon mobile apps, as mentioned above isn’t restricted to certain sections alone. They can work for many a ventures. They can bring about a paradigm shift in the work culture of the enterprise. They can control almost everything; right from authorizing the entry of a staff member, handling communication and customizing almost everything within the given space, there is nothing that the bacon cannot handle via iBeacon apps. If combined with Bluetooth, it can create something invincible in the tech world. 2. Beacon mobile apps in malls and departmental stores: There’s a lot many aspects with regard to a mall or a supermarket that can be covered by the Beacon. Imagine something amazing like having an iBeacon mobile app that notifies you every time there is an offer, a discount spree, freebies, etc. iBeacon comes handy. Simply feed the data and every time you walk past a product, get the latest updates on the same. This can also facilitate mobile payments as it is compatible with Near Field Communication technology. Apart from that, with the inbuilt positioning services, one can find their way out of the mall, navigate the area without any problem. This works well when traveling to places that are new and wherein the language is alien. 3. Beacons in Hospitals: Beacons can do a great job when it comes down to implementing the best of its functionalities in hospitals. Hospitals these days can simply perplex people and what can do better than an app that can locate the concerned department especially if you are in areas where internet connectivity isn’t great. Visitors can locate wards and patients can find their way to the right floor and department. 4. iBeacon Apps and transport: It isn’t just about transport. It’s more about transport engineering. From planning logistics to completing the transport process, iBeacon apps can simplify the process without any complications. It can meticulously plan your travel process and this is incredible. iBeacon technology apps have proved their potential while operating in fields like hospitality, education, transportation, banking and financial services,etc. Many developed countries have adopted iBeacon technology as a part of their development projects and iBeacon technology apps have proved itself here in. This amazing technology has the potential to better things for the larger good of corporate as well as the common public. iBeacon technology is indeed one of the most useful technological advancement and it wouldn’t be wrong to say that iBeacon mobile app has it in them to take the app world by a storm in our country. With features and functionalities that aren’t dependent on the internet nor have any impact on space and size, these apps can create irrepressible ripples. Customized iBeacon app development is something every entrepreneur must try and if you have an idea that must meet its technological base, simply write to us at sales@signitysolutions.com. Our experts at Signity Solutions can help recreate your idea with iBeacon technology aide.